The leftovers from Thanksgiving have all disappeared so now it's time to shift gears to gift giving. Finding the perfect gift can be tricky so to help you this holiday season we've rounded up some of our favorite foodie gifts. A little something for everyone, from the cocktail enthusiast to those interested in a greater good, happy shopping! 1. For those interested in expanding their culinary knowledge: Culinary Artistry talks about plate composition, juggling flavors, insights from highly regarded chefs, and a plethora of flavor combinations that would make any home cook seem like a well educated food person. 2. Pastry lovers will rejoice when they open their doors and find this Rustic Burlap Sack filled with William Werner's (formerly of Quince and Ritz-Carlton Half Moon Bay) delicate confections, preserves, pastries, and savory breads on their doorstep. For $35 a month you can send a delicious bag of goodies like Apple-Praline Butter, Pear Pate de Fruit, Smoked Almond Brittle, and Oak Bourbon Caramels. 3. Every cook in training needs a good knife and the Wüsthof Classic Chef’s Knife is a great knife for preparing any meal, no matter how simple. The German made knife is great for chopping, dicing and slicing and will be their go-to in the kitchen for years to come. 4. For the true cocktail junky give them the gift of perfect ice. With the Spherical Ice Tray Set you can make sure they have cool drinks from the first sip to the last. 5. 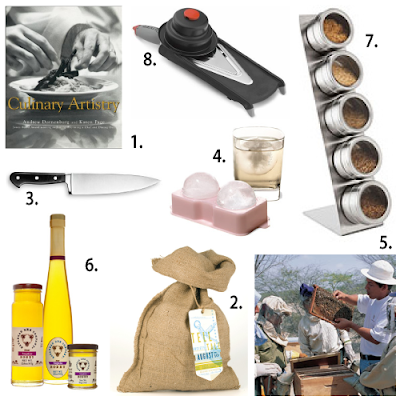 For those looking to give a gift that keeps on giving buzz over to Heifer International and order a beehive that will help struggling families earn income through the sale of honey, beeswax and pollen. 6. Need another sweet gift? Check out Savannah Bee Company Tupelo Honey, one taste of this and they'll never touch one of those honey bears again. 7. Spice up their life with the Magnetic Artisan Salt and Spice Rack. A sleek stainless steel rack that comes with five round magnetic tins to seal in flavor while allowing for easy accessibility. It even includes gourmet salts like smoked serrano, vanilla bean, and thai ginger. 8. Give the gift of knife skills they'll be sure to want to show off. The de Buyer Kobra Adjustable Slicer is a user-friendly adjustable slicer from France for uniform and precise slices without taking years of practice in the kitchen.